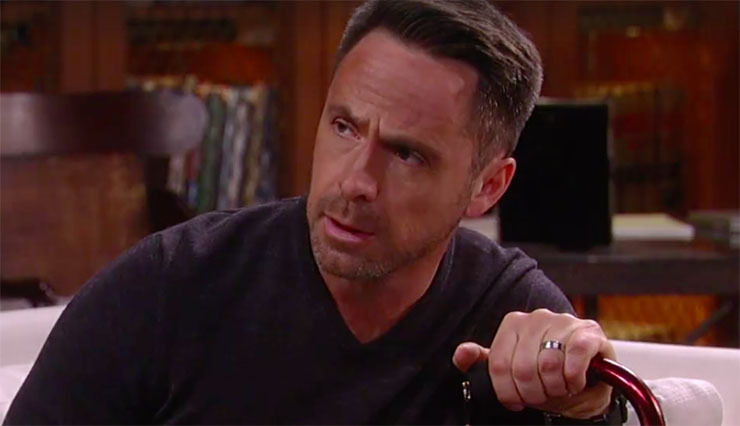 “General Hospital” spoilers for Wednesday, January 25th, reveal that Franco will pay for what he’s done and Julian makes use of some underhanded tactics. Franco (Roger Howarth) essentially went wild when he thought Liz’s (Rebecca Herbst) life was threatened by Tom Baker. Unfortunately for Franco, Tom does have one person interested in getting vengeance for him: his brother. He may be the one who tomorrow looks to make Franco face the consequences for his actions of late. A mobster blackmails as easily as he breathes. And so it is with Julian (Will deVry). He has had to defend the vulnerable Alexis (Nancy Lee Grahn) late, because, despite what he’s done, he loves her. His vengeful sister, Olivia (Tonja Walker), recently came back and informed him that she’s going to make trouble for Julian. Wednesday he uses blackmail to get what he wants. Jason (Billy Miller) needs to keep himself in tip-top shape, what with all the people who love and rely upon him. A new such person will soon be in his life once Sam (Kelly Monaco) gives birth! Disturbingly, he gets falls ill tomorrow. Let’s all keep our fingers crossed that he’ll pull through. It feels like just yesterday we got Jason fully back. We, like his family and friends, are not ready to have his health in jeopardy once again, when Tuesday he collapsed at the Metro Court. Hopefully the doctors at GH can help him.